Oh what a day! We knew we had a high chance of rain or storms today and got up a bit earlier to get some miles in before the rain. We got going at 6:30am and the dark clouds were already expanding quickly from the east side of the lake. We knew the rain was forecasted to start around 11am and last the rest of the day, and it was not good timing. 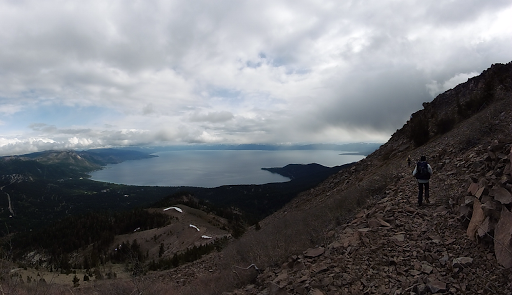 We were projected to hit the highest peak on the trail, Relay Peak (10,301′) after lunch. 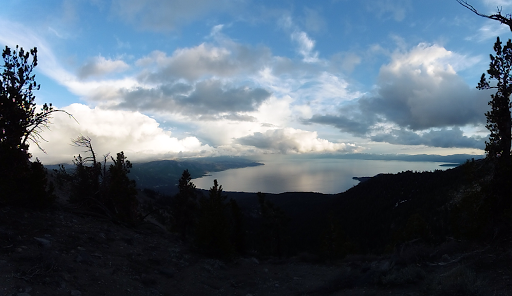 We were cruising this morning with 9mi of some gradual up and then down to Tahoe Meadows. Great views most of the way and it was fun to see that we were finishing the east side and making the turn to the north side of the lake with a new perspective. As we hiked, Rockin was back about 20yds as Why Not and I were chatting for a good hour. Suddenly, Rockin caught up to us full of kinetic energy saying that she didn’t know what to do with herself with no obstacles to focus on. It was hilarious. She was really worked up and said she needed a fallen log or obstacle or something. It was funny because I’m in the exact opposite mood. After the Hayduke, I need a break and this autopilot hiking is wonderful! I pointed ahead to where we were headed and the clouds were gathering and told Rockin that there was definitely an obstacle ahead. Soon after this conversation, the temps dropped to 45F, the wind picked up, and the sun was gone. Why Not was hiking faster just to stay warm. 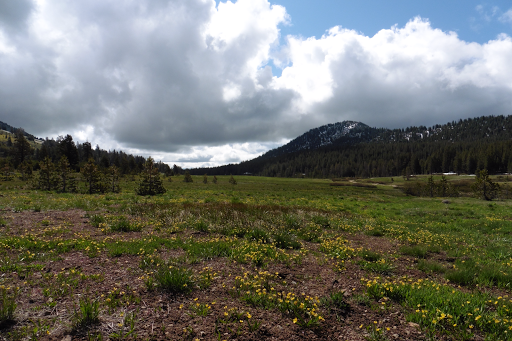 We dropped down into Tahoe Meadows and it was a beautiful meadow. We took photos, but were pretty cold and could tell the rain was eminent. 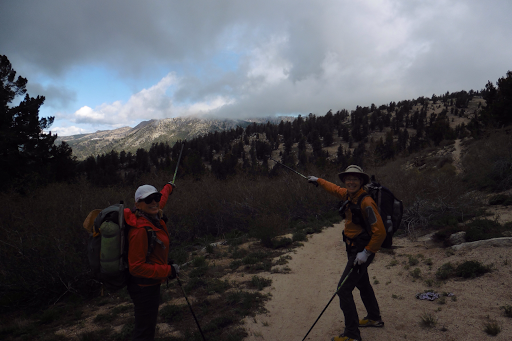 We had done 9mi and had 7 more to get up Relay Peak. We just hoped to get over that before the rain… Almost immediately after climbing up from Tahoe Meadows, we hit of patches of snow in the trees. Boo! 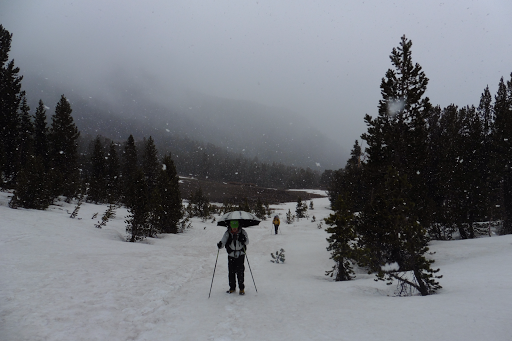 This wasn’t a surprise, but then it became mostly snow and it required actual navigation to find the trail. This amount of snow was not expected. Luckily, it was mostly compacted with little postholing. It definitely slowed us down a bit. About 3mi up, we were up in the clouds and heard thunder rumbling right over us. Fortunately, the wind had died down, but we weren’t sure how heavy the wind would be. We decided to keep going since the foul weather was supposed to stick around the rest of today and tomorrow and there wasn’t really an option to wait it out. The precipitation did come soon after that…in the form of SNOW! Not just a little, but a lot. It was nice thick snow that fell nicely and we all found it to be quite magical and were glad to have snow instead of rain…and umbrellas! It lasted over an hour and the challenged navigation continued. I took the lead since I have a lot of battery and can use my phone for navigation. I felt a surprising surge in energy and alertness. It was like being on the PCT in 2011 again! It was fun to find the trail and Guthook’s app was very helpful. 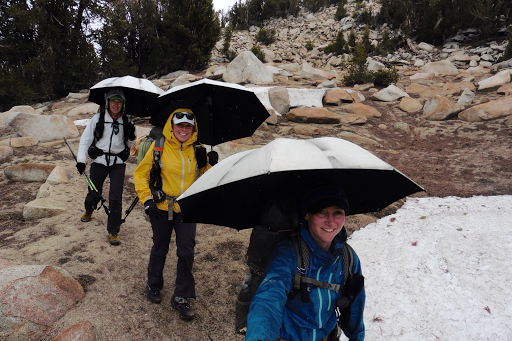 The three of us all took it in stride and all have lots of experience in these conditions and terrain. Heck, we even enjoyed it and found it entertaining. 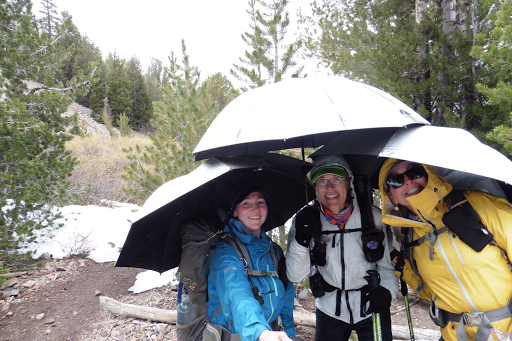 I just love being with other hikers who enjoy this kind of thing and aren’t phased by it! 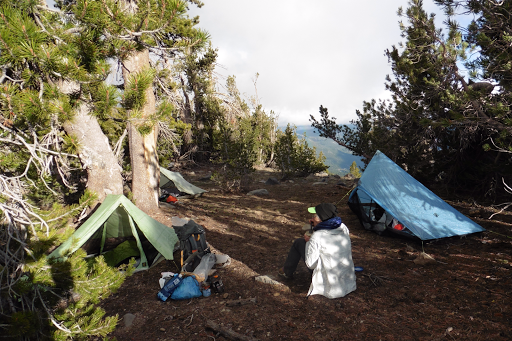 The sun came out briefly and we were warm enough to enjoy sitting down for lunch before continuing up. 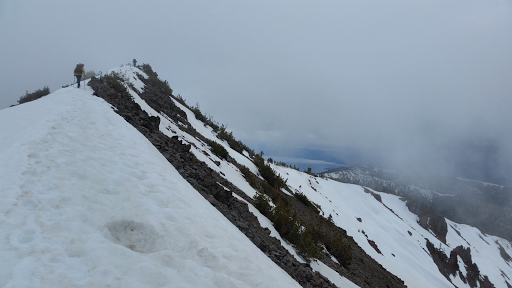 The snow covered the switchbacks up to Relay Peak and we found ourselves just climbing up steep dry grades to try to find trail again as the next wave of the weather moved in quickly. There wasn’t any thunder, but we were in and out of clouds sometimes with very little visibility. It felt like this was a winter hike. We just wanted to get over the peak before it got bad and pushed on. Just before the final ride walk to the top, the clouds cleared momentarily for a great view of where we were headed. Just magical! We hiked up in a cloud and were sooo thankful it didn’t rain. Rockin’ got her obstacle for the day, that’s for sure! 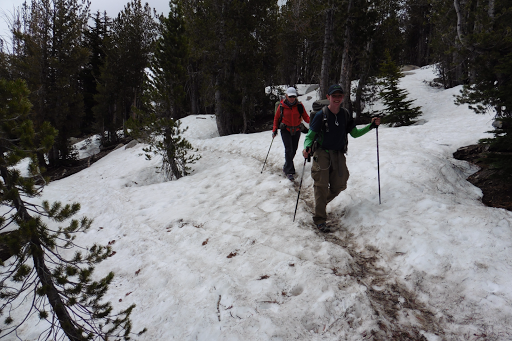 Once over the top, there was still snow on the switchbacks down, so we got to benefit from the snow on this side and cut the switchbacks to avoid sketchy traverses. 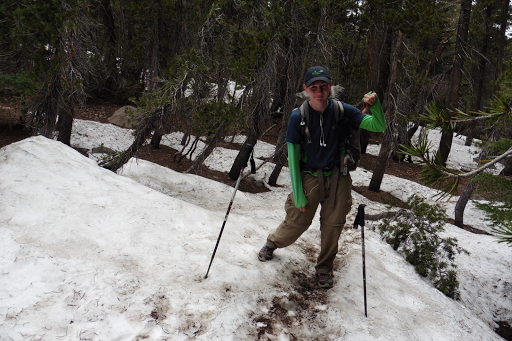 We finally got low enough that there was more trail than snow…and then it started to sleet, ha! It was light and didn’t last too long, but was enough to use the umbrellas. After over 5hrs in more snow than trail, we got a break! 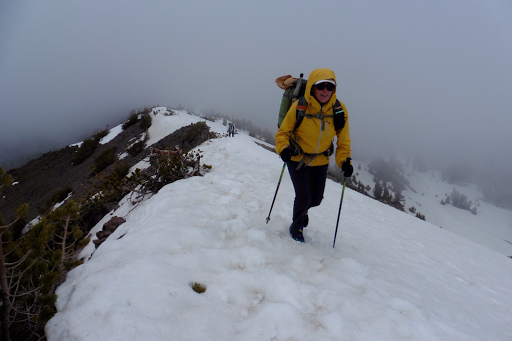 We saw one other hiker and he said there wasn’t anymore snow for the 30+mi to Tahoe City where we will resupply. We turned a corner and got our first views from the north side of the lake. We have been using Guthooks app to determine how far we are from water sources. We planned to hit one at 5pm and knew there wouldn’t be another source for 16mi. As we were walking on a dry ridge, we crosse a trail intersection and it hit me that we should have seen water…upon further investigation, we found out the water was at least a half mile off the trail, ugh! That was not noted on the databook description of the app and I hadn’t looked for it on the map. Usually, if the source is off trail, it’s noted. We were pretty tired and dark clouds were gathering again as we found ourselves up pretty high on a somewhat exposed ridge. We had no option and needed the water. We set off down the side trails and within 50yds hit big snow drifts and then solid deep snow. It was terrible! We reassessed our options and realized it would take forever to get to that water IF we could find it under the snow. 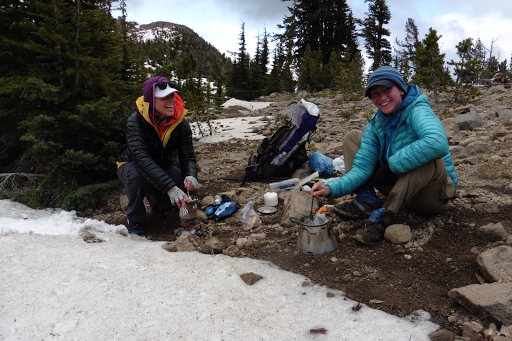 We decided to use Rockin’s Jetboil to melt snow for water. We all needed two liters and quickly came up with a method to do it as efficiently as possible. Thank goodness for Rockin’s Jetboil! We were lucky that it was wet snow and it only took about 45mins to melt all the water we needed and the clouds were getting more intimidating. We had planned to go at least two more miles and decided to play it safe and just camp where we were even though it was high and not too protected since it was already 6pm. We didn’t want to risk getting soaked at the end of the day, plus we finally got a campsite with a view! The lake was right behind us. I have mentioned my feet and today they actually felt better in the cold snow for some unknown reason. When I took off my socks, they were covered in peeling skin on the bottom from the healing from the Hayduke. It’s hard to see, but there is lots of dead peeling skin. Better than blisters! It’s really cold and has been raining/sleeting on and off since it’s gotten dark. The clouds were amazing over the lake as the sun was setting! It’s in the upper 30s in my tent and colder outside, but thankfully no wind. I’m wearing my rain pants for added insulation over my wool pajama pants and I have my down jacket with my beanie, hood, and buff over my head. Whew, it’s gonna be a cold morning too!